This feat came via the #PortaPottyChallenge, a recent craze on Social Media. Although not an official World Record, pictured here are 40 Students from South Carolina crammed into one XL Unit! This has turned itself into a bit of a spin-off from a previously common feat of cramming individuals into a single phone booth. During a visit from the pope in 2015, 3000+ Units were setup in Philadelphia to account for the 1 million+ attendees. More significantly was the reported 3x daily cleanings that EVERY unit needed! It can get overlooked – but NOBODY wants to be the host of a Special Event where bathrooms were shorted. Unlike the first two records, this portable toilet wasn’t really made to be used – but rather, driven! Jolene Van Vugt drove her toilet (pictured here) at a record 75km/hr. Having since been nicknamed the Porcelain Bus. Obviously, this technically does not belong as part of our Portable Toilet World Records. However, we believe in giving credit where credit is due! Kevin Shelley broke 46 Wooden Seats with his head in one minute. Accomplished all the way back in 2007! 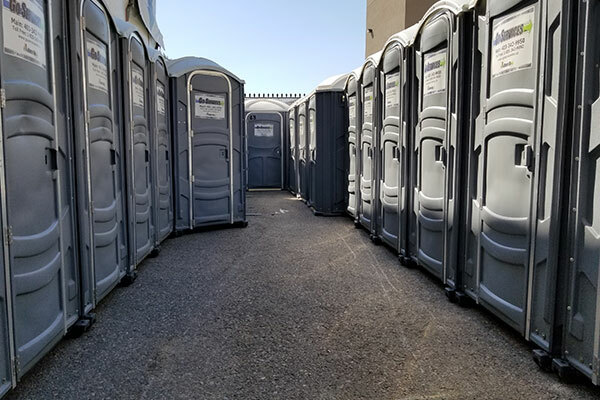 Save yourself a headache, and look to Go Services Inc. for your next Portable Toilet rental in Central Alberta!